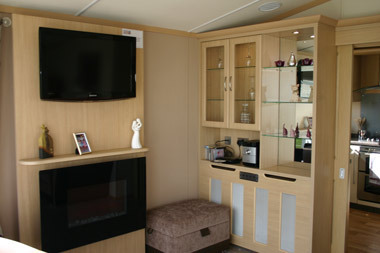 Anyone looking for a top quality static caravan will have to go a long way to find one better than the Carnaby Essence. It is a single 40ft x 13ft two bedroom home. Its ex works price is way above the majority of similar size holiday homes, but having said that, it does come virtually complete – even down to duvets and pillowcases. The home is built on a fully galvanised chassis, has Sandstone plastic cladding, and a steel pantile roof, whilst all the doors and windows are UPVC double glazed. Additionally, the doors and windows are graphite grey coloured externally, but white inside the home. The end wall of the lounge is almost all glass being a unit containing French doors with a pentagon shaped window above them, and a deep window either side. A second door around two thirds down the front elevation, is the main entrance into the static caravan with doors off the hallway giving access to the daytime and night time accommodation. The door to the left as you enter leads into the kitchen and dining area with a sliding door that leads into the lounge at the end of the home. The kitchen is one of the best equipped we have come across in a long time with an integral dishwasher, a fridge, a freezer, and microwave all being included as standard. There’s a reasonable amount of work top space, plus storage in the floor and wall units, the latter featuring under unit lighting. Although the walls have not been tiled, there is a deep splashback behind the five burner hob, reaching up to the stainless steel extractor hood. Below the hob is a full oven. Opposite the kitchen is the dining area which is furnished with a circular glass top table and four padded chairs. It has to be said that the amount of room here is fairly small and as such, we came to the conclusion that four is the maximum number who could sit comfortably here. As mentioned previously, a sliding door separates the kitchen and dining area from the lounge. To the left as you enter is an L shaped settee incorporating a sofa bed. In the corner of the lounge opposite the settee is an armchair on a swivel base and next to it, on the home’s rear wall, is a panelled unit with a flame effect electric fire with a backlight feature. On the panel above the fire is a module with the connections for a flat screen TV – not a standard feature – whilst on the party wall with the kitchen is a built in display unit. This has a speaker control panel enabling music to be piped into the kitchen and bedrooms via ceiling speakers. As you walk into the hallway from the kitchen, the first door on the left is the second bedroom which has twin beds with a bedside cabinet between them. At the foot of the bed on the left of the doorway is a most attractive built-in unit comprising a dressing table with four drawers to the left of the kneehole, a large mirror, shelf, and downlight. Facing the dressing table at the foot of the bed on the opposite wall, is another built-in unit, this one being a double wardrobe with two drawers in its base and a small angled shelf. Above the shelf is a connection point for an optional flat screen TV. The next door along the hallway is the boiler cupboard, followed by the door to the main bedroom. 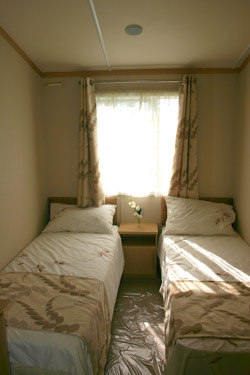 This has to be the best feature of the static caravan, being superbly furnished with a double bed behind which is a panelled unit spanning the room. 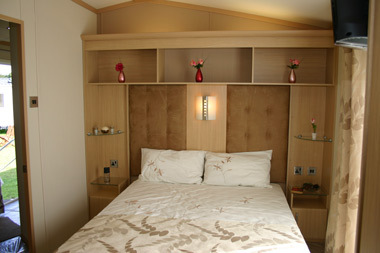 The unit incorporates two bedside cabinets, each with a glass shelf above it, followed by three open shelves above them. There are two tall padded headboards reaching up to the shelves with a very attractive reading light between them. Additionally there is concealed lighting above the top of the unit. In the corner opposite the foot of the bed are a double wardrobe and a unit containing three large drawers with a dressing table top and mirror above them, although there is no kneehole. 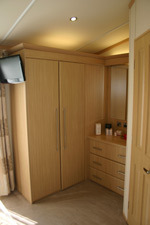 On the end of the wardrobe, facing the bed is a connection point for an optional TV. Next to the dressing table is the door to the en suite which has been fitted out with a large rectangular washbasin set in a vanity unit, with toiletry storage in a double door cupboard below the washbasin. The wall above the washbasin has been panelled to below a mirror door cupboard, whilst to the right of the base unit is a low level toilet with a concealed cistern. A radiator has been fitted on the wall opposite. 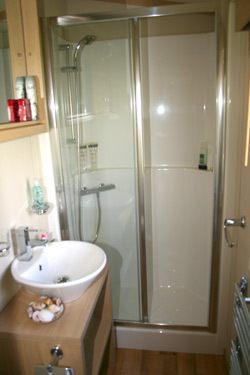 From the hallway opposite the door to the main bedroom, is the door into the home’s shower room. Immediately inside is the low level toilet followed by the circular washbasin seated on top of an open vanity unit, with a rectangular shower cubicle beyond it at the end of the room. 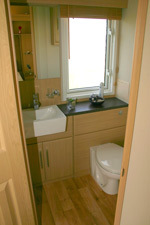 As in the case of the en suite, there is a mirror door cupboard above the washbasin. Here, instead of a conventional radiator, a chromed towel radiator has been fitted on the wall opposite the washbasin. The company does offer an alternative to the en suite and shower rooms both of which are fairly small, by combining them into one larger room in which a bath replaces the shower. Access remains via a door in the main bedroom and another from the hallway. Vaulted ceilings are standard throughout the home as is full central heating a bonus if you use your holiday home in the colder months. Lighting generally is via downlights in the ceiling with a very modern, attractive, double standard lamp providing supplementary lighting in the lounge. Interestingly too, the rooms have coved ceilings but instead of it being the usual white coving, here it is timber of the same light oak as used for the cupboards and panelling. The Essence has been built to EN1647 and the company does stress the fact that it is not intended to be lived in throughout the year. In fact, it states in its literature that it is intended for weekend visits and short duration stays, plus holidays of not more than six weeks continuous use. This, we have to say, is the first time we have come across such advice and we are at somewhat of a loss to understand the reasons behind it. Having seen the home, and the build quality, providing the site licence allowed, we would be happy to stay for long periods including – because of the double glazing and central heating – over Christmas and the New Year. 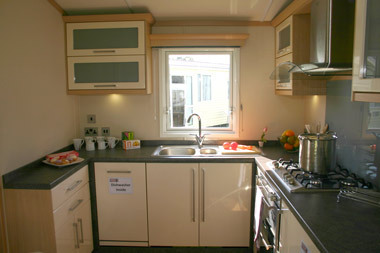 In all we think this is a top quality static caravan with excellent equipment levels in the kitchen and a fantastically furnished main bedroom. 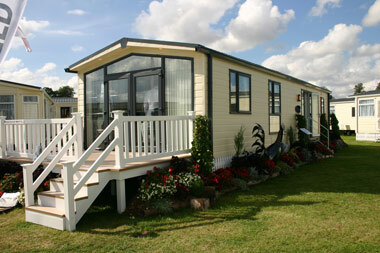 If you’re looking for a luxury ‘van the Carnaby Essence is well worth adding to your shortlist. 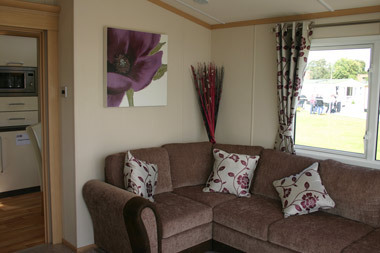 as a disabled caravan owner i looked at this modle and it is the most stunning home i have looked at im just so sad i dont have the funds to buy one, it has so much room it works for me as i have arthritus and find most new homes dont have good handles on cupboads ,doors,room for disabled this is fantastic.5 star plus.